It’s been a busy summer, so busy I haven’t blogged much. That and in all honesty, I’ve not been sure what to say about it all. I am referring to my field research experience in the Maldives. I’ve been researching perceptions of migration and climate change. It’s the kind of place most people only dream of seeing and now that I am in the process of booking a return trip to another island, I have been reflecting on my past trip. 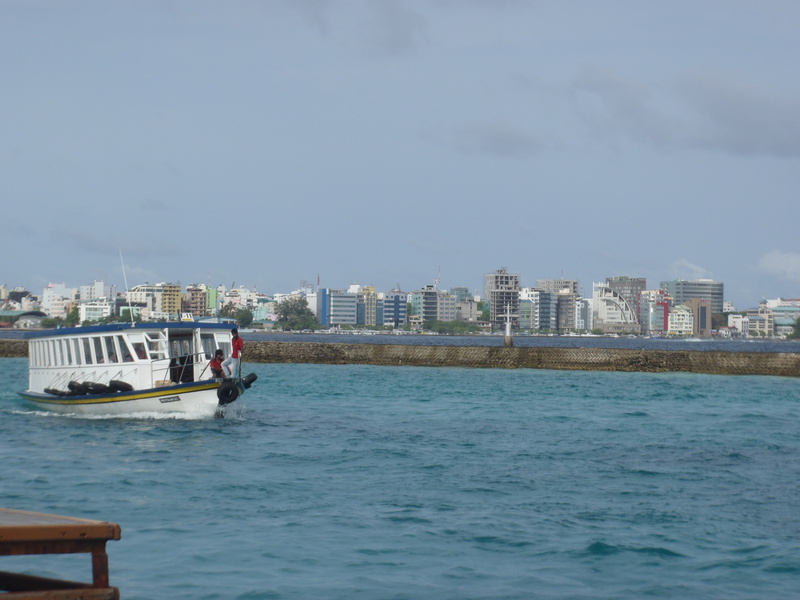 This is the overpopulated capital of Male. Upon arrival it seems anything but paradise. But that’s how island tourism sells itself; bragging about the beaches when the culture is just as fascinating. The capital is crazy busy and is full of shoe stores- who’d of thought?! Most tourists go straight from the airport island to their resort missing the night life and food. People are up at all hours moving about, shopping, or just watching the waves come in as I did with a colleague. If you’re not careful, you WILL be run over by a scooter, so watch out. Each neighborhood has its own park and mosque, but don’t fall into stereotyping; many people skip prayer time, probably as many as skip church. 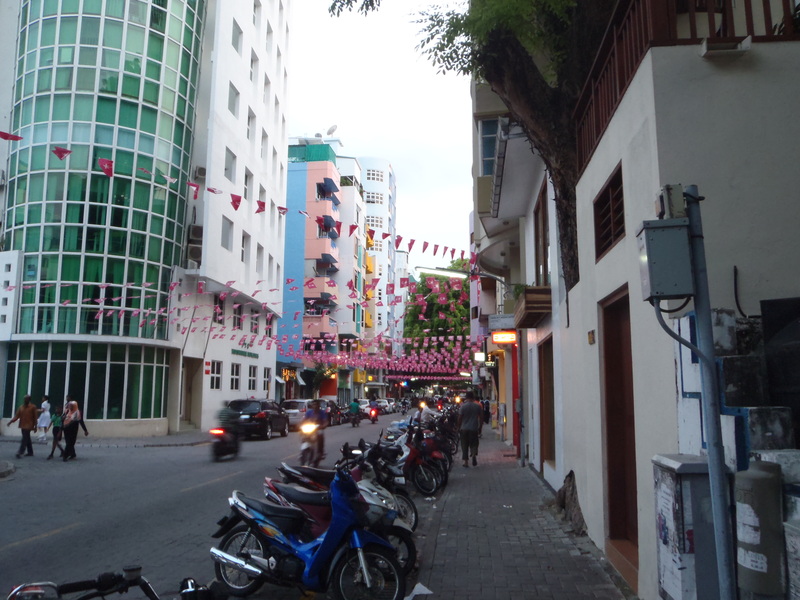 When you walk the streets, you will see little colored flags; they indicate political party support. Here, politics is VERY local. While I’ve had a successful political career in America as well, I’ve never seen a business owner paint his building in the color if his preferred party, but it happens here. Traffic is really bad and walking tends to be much more efficient. There is a lot sensory overload also, but its entrancing. I’ve had a hard time expressing my thoughts about my trip because there was so much to interpret and so much that I learned. I don’t know why its been hard to put into words. Male is a crazy place, but metropolitan in nature. If you are on a street in the middle of an island, you’d have a hard time believing you were even on an island. The Maldives sells itself as an exclusive beachy resort nation, but the day to day life of those who live and work on the capitol is anything but. Highrises abound as a way to accommodate the 100,000+ inhabitants. And the rents are very high (comparatively) leaving many extended families in cramped apartments taking turns to sleep. Male also holds the University so it is a city full of youth looking to better themselves. Upon my first glance, the Maldives was much more complicated than I had expected. Overwhelming and yet simple, modern and still highly connected to it’s past, developed and still stratified. The Maldivians tend to have the better jobs while many immigrants are hired to work in stores, restaurants, and in child care. They are proud of their home and have become accustomed to a way of life that revolves around the sea and their mobile phones. Even those of limited means have nicer cell phones than I do. The journey began there and continues on between Guraidhoo and Kandooma. Here’s a great birds eye view of the Island I just found.